Hi everyone! Welcome back for another episode from my by-monthly Yippee For Yana video series for Simon Says Stamp Blog! In today’s episode I’m creating a fun stamped, colored and die-cut background for a card using Breakfast Buddies stamps. You can easily apply this technique to other small images from your stash. 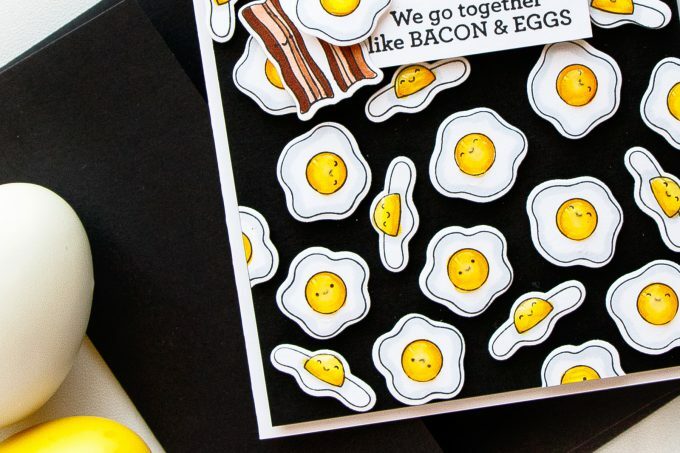 This stamp set features a bunch of images of food that one would usually have for breakfast plus there are fun sentiments that go along with each type of food. Finding inspiration for my projects is sometimes a tricky business. I like to keep a special board on Pinterest where I pin images that I find inspiring. 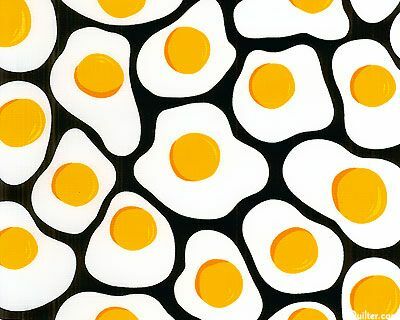 As I was browsing my board for inspiration I came across a fun eggs pattern image and decided to use this as inspiration for my project. 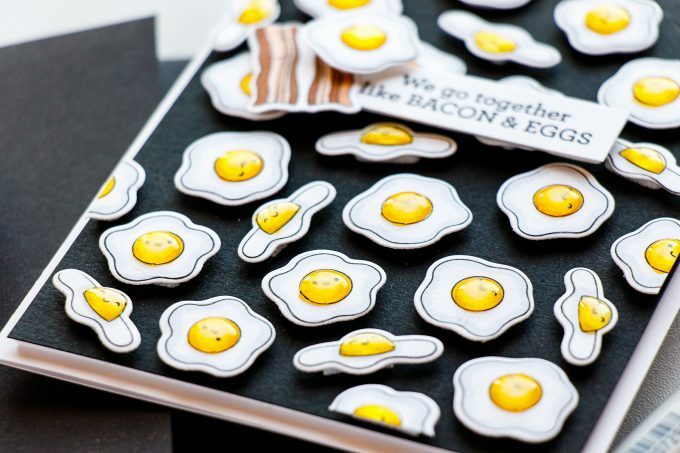 I mounted all 3 egg images on my clear block (to save time as it didn’t really matter in which order I stamped them) and stamped a bunch of eggs at once in Simon’s Intense Black Ink onto white cardstock. For my coloring I picked Copic markers and the reason I went with Copics is because of the ease of use. I can quickly color a bunch of images, do some easy shading and be done in 5 to 10 minutes. If I were to color one or two images I could have picked colored pencils and or watercolor and really took my time to do some awesome and detailed coloring, but since I was doing a lot of coloring I didn’t want to focus much on it, besides the coloring is not the start of the show on this project, its the pattern itself. I used Y19, Y15 and Y11 to color the yolk and C1 marker to add a bit of sharing to the egg whites. I don’t think that was necessary, but I felt like I wanted to add just a bit of gray here. Once my coloring was done I used coordinating dies to cut these images out in my Platinum die cutting machine. 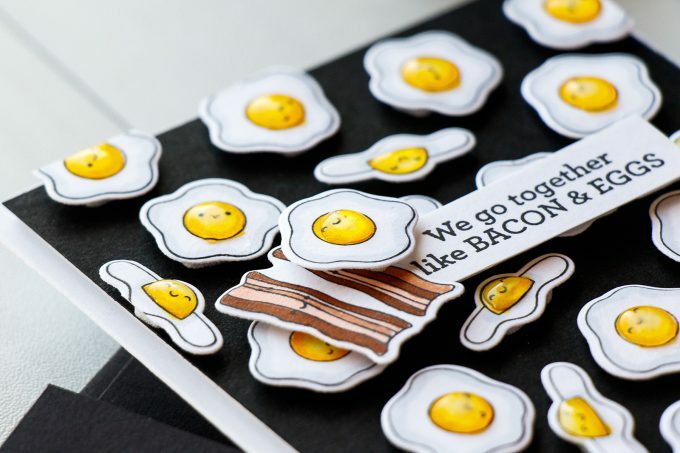 There is a die for every image in this stamp set, so if you have these coordinating dies it makes cutting these a much easier task. Next, I cut a piece of black cardstock to 4 x 5 ¼” and started working on my pattern. Lets rewind a little bit and talk about the different kinds of patterns or background I like to make. There’s one kind of background where I do a lot of stamping and I stamp everything directly onto a card front or onto a panel that goes on the front of my card. There’s no die cutting involved in that kind of background. 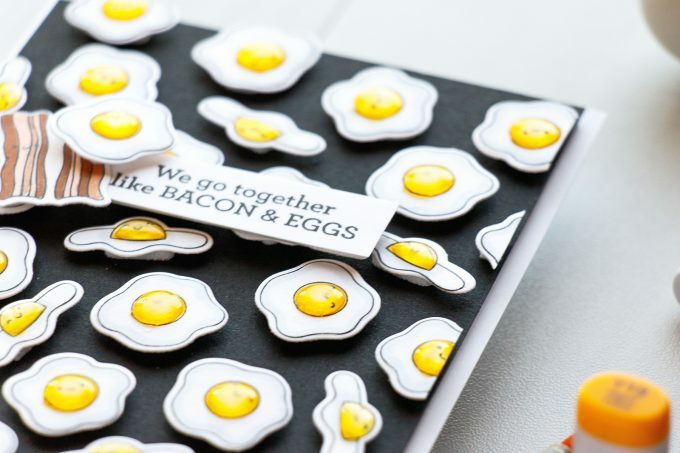 There’s also a kind of background, and I like to call that dimensional pattern stamping, is where I stamp my images but I also cut them out with coordinating dies and form a pattern or a background on my card. In this case I also like to use foam adhesive to pop things up. I like to do that when I form clusters of images, for example I have florals and leaves and I don’t wanted to do masking, so I would cut the images out and foam mount onto the card, or like I am showing in this case I want to have a dark background, but I don’t want to spend the time coloring that background. 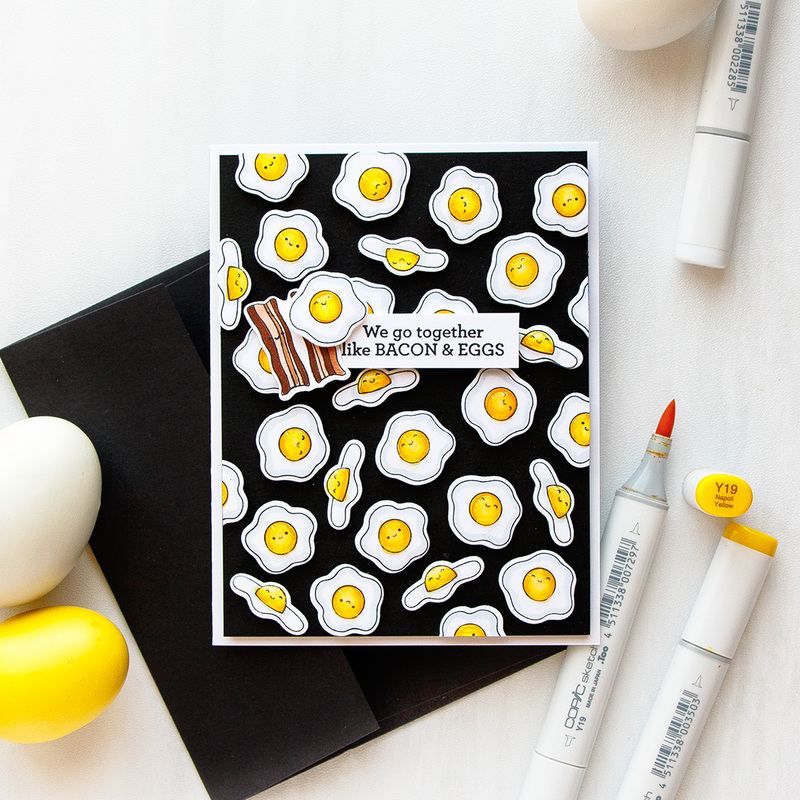 It would have been harder to stamp the eggs onto a white cardstock piece, color the eggs and also color the background black. It’s much easier, if you have coording dies, to stamp and color the eggs, cut them out and just foam mount them onto a black background. I used my Krystal Catana pick up tool to pick up the pieces from my desk and help me position them on the paper with the help of foam adhesive. Because I want this background to look as if was cut out from a larger sheet I am trimming some of the die cuts and letting them go outside the edge or rather I’m making it look like as if they go outside the edge. To make this background appear random I’m using the usual tricks: rotating the images as I adhere them onto the card, mixing my images – I have 3 different shaped eggs so I am making sure I don’t have them all grouped, but rather spread out on the background and lastly I am not adhering things going on a straight line. This is not the kind of background where I want things to have a very clean and linear look. 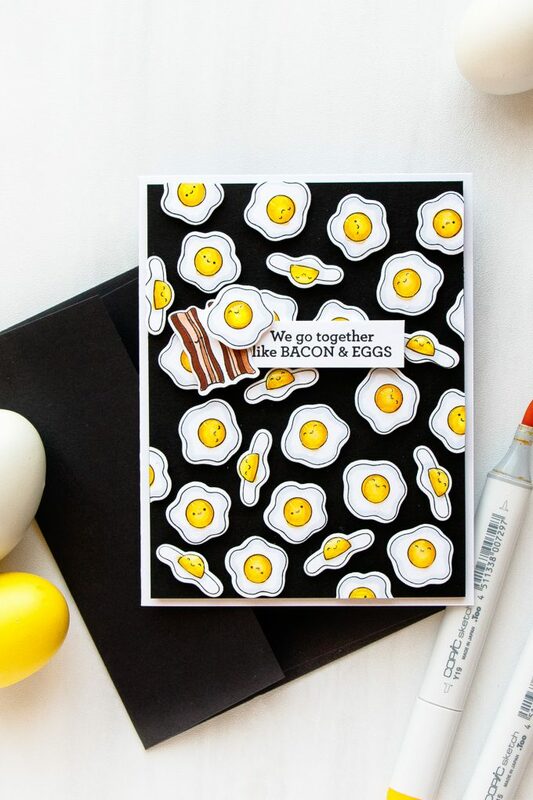 To create a sentiment for my card I stamped We Go together like Bacon and Eggs in black ink onto a strip of white cardstock and I also stamped some bacon onto another piece of white paper. Once my background was finished I used fun foam and foam mounted this panel onto a white A2 card base. 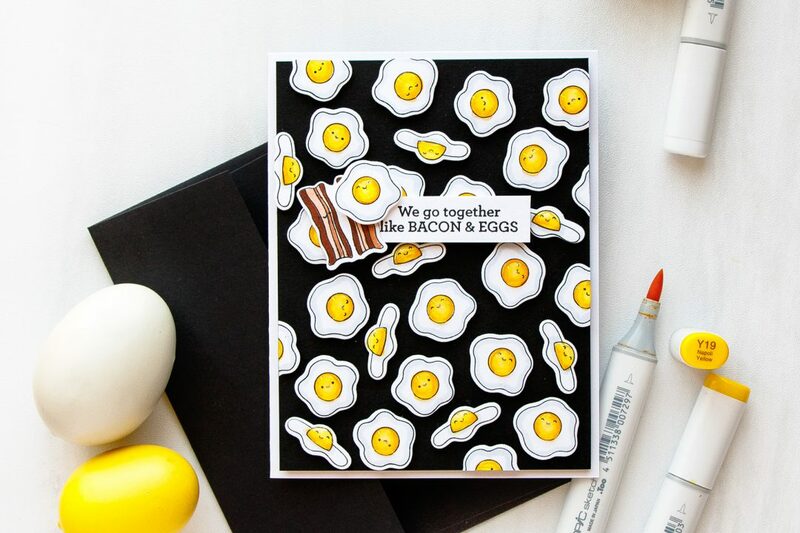 Lastly, I used glossy accents and I coated each egg yolk with a generous layer of glossy to create that realistic looking glossy dome to the eggs. What a cute card! You did a fabulous job of putting this together.